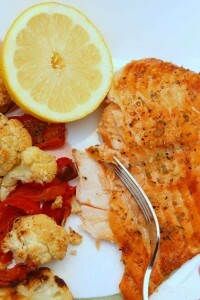 Lemon Cedar Planked Salmon cooks slowly and stays fabulously tender and moist. Soak cedar plank for a couple of hours. Layer sliced lemons on plank. Place fish face down on top of lemons. Pour lemon juice on fish and then brush with a little olive oil. Mix all seasonings together and sprinkle on top of the salmon. Grill for 20-25 minutes until internal temperature reaches 145 degrees F.
Please keep in mind to adjust the temperature/cooking time accordingly in relation to the weather.